The Forbidden Room is proof positive that the scraps from Guy Maddin's cutting room floor are better than the footage that makes it into the films of pretty much everyone else. Comprised of unused footage cobbled together from other projects, The Forbidden Room is like a trip down the rabbit hole of Maddin's singular psyche. Here he introduces us to a lost submarine crew faced with an impossible decision, a logger tasked with rescuing a maiden from a tribe of primitives, a surgeon who falls in love with his beautiful patient, only to be kidnapped by skeletal insurance defrauders, a man whose obsession with women's bottoms leads him to get a lobotomy (arguably the film's most indelible interlude), and a man who gets turned into a banana because of an ancient curse. And that's just scratching the surface of this delirious, mad, altogether beautiful work of art. 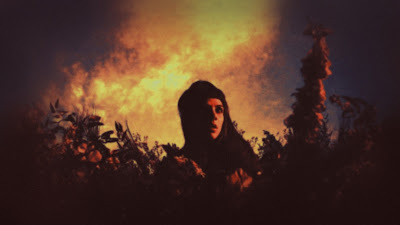 Maddin's work has always been deeply rooted in silent avant-garde, and it's great fun watching him play with the medium in so many different ways. The Forbidden Room showcases Maddin at his most experimental and playful (who else would bookends a film with an instructional video on how to take a bath?). Each frame is a fantasia of oversaturated color, jump cuts, missing frames, and grainy, damaged footage. The film feels deteriorated, like a relic from another time. Yet there is something warm and familiar about it, even at its most alien. 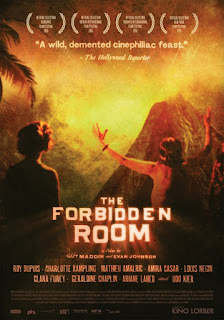 Maddin clearly loves film, and The Forbidden Room is a celebration of the artificiality of the medium. Nothing about it feels real, as Maddin embraces the sheer movie-ness of it. Natives dance around a papier-mâché volcano, characters walk in front of obviously painted backdrops, it embraces its fakery and uses it as a deliberate style choice rather than a crutch. It only seems natural, given Maddin's obsession with lost films, that he would one day create a "lost" film of his own. It's surprising just how well these disparate fragments all fit together, yet they seem to create one cohesive whole. At least as cohesive as a Maddin film can be. Maddin thinks in abstracts, he makes films that you feel rather than "understand," and The Forbidden Room evokes a forgotten aesthetic that feels as if we have unearthed a buried treasure. Only Maddin could create something that looks like a relic yet feels so fresh and new. It's a tour through Maddin's favorite predilections, a darkly hilarious, thrilling, and strangely moving amalgam of some of his previously lost ideas, resurrected here with fiery new life. 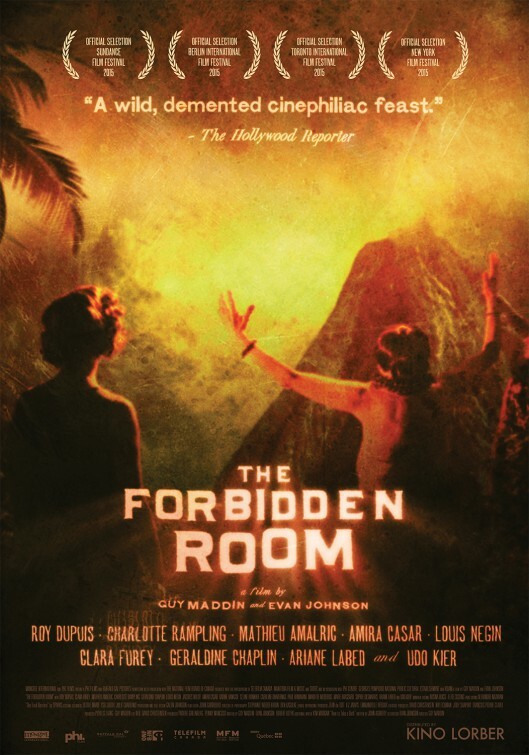 THE FORBIDDEN ROOM | Directed by Guy Maddin | Stars Charlotte Rampling, Udo Kier, Mathieu Almaric, Louis Negin | Not Rated | Now playing in select cities.